Hard to say if this is a reliable rumor, or not. 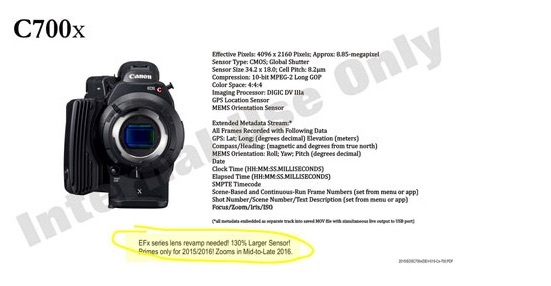 Image and specs of an unseen Canon EOS C700x leaked over the web. There is more. According to the rumours, Canon may planing the introduction of global shutter and 4K video in the EOS Cinema lineup. It would also mean Canon is going to introduce a new model in their Cinema line-up. I prefer to rate this rumor CW3 for the time being. next post: (CW4) Canon EOS C500 Mark II Coming for NAB 2015?